Educators have a different take. 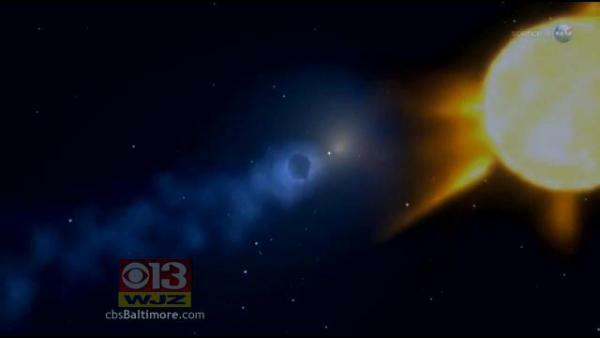 “It’s called Comet ISON,” said Jim O’Leary of the Maryland Science Center. NASA provided an image of ISON (agove). It has a small head and a big tail. “That tail can get tens of millions of miles long, so it’s huge,” O’Leary said. But in its middle, it’s just dirt and ice three miles across. Three miles is large enough to comfortably fit between the shores spanned by the Bay Bridge and its approach ramps. It’s certain to light up the winter sky. That is, unless it doesn’t. They don’t know if the sun will blast it to shreds. “It’s only passing through one diameter away from the sun, 700,000 miles, through the hot corona. That might be enough to blast it apart,” O’Leary said. In that case, it could turn into smaller comets or disappear completely. And if it doesn’t bust apart it will be visible for weeks, from December in through January. The Maryland Science Center expects to have special programs if the comet is as visible as they hope it to be.